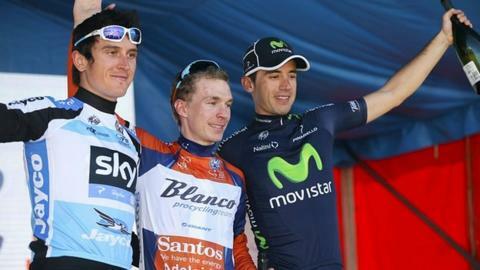 Britain's Geraint Thomas climbed back to finish third overall after the sixth and final stage of the Tour Down Under. The Welshman, who led after stage four, finished 25 seconds behind Dutchman Tom-Jelte Slagter with Spaniard Javier Moreno 17 seconds adrift in second. Thomas dropped to fifth on stage five but had a first and a third in the sprints to end on the podium. "We were disappointed yesterday but there was still one more day and we had a slight chance of third," he said. "The boys in the team were incredible again - it was a perfect day really and it's been a pretty successful week." Team Sky's Thomas, 26, won the second stage to take the overall lead and held it until finishing 17th in Saturday's tough 94-mile stage. "I was pretty down yesterday but coming into the race, if I thought I could come away with a stage win I'd have definitely been happy with that," said the double Olympic team pursuit gold medallist. Slagter took the overall lead after finishing second behind Australia's defending champion Simon Gerrans on Saturday's penultimate stage. And he stayed clear in the final 50-mile stage through the streets of Adelaide to win the general classification in 18hr 28min 32sec. "It's really strange for me, I'd never won a race like this," said Slagter. "My first win was [on stage three] at Stirling and that I take the jersey now, it's really amazing. I can't believe it actually." Germany's Andre Greipel outsprinted Australian Mark Renshaw and Norwegian Edvald Boasson Hagen to win the final sprint and take his third stage win of the tour and his 14th overall. 1. Tom-Jelte Slagter (Ned/Blanco) 18:28:32"
2. Javier Moreno (Spa/Movistar) +17"
3. Geraint Thomas (GB/Team Sky) +25"
4. Jon Izagirre (Spa/Euskaltel) +32"
5. Ben Hermans (Bel/RadioShack) +34"
7. Gorka Izagirre (Spa/Euskaltel) +36"
9. Tiago Machado (Por/RadioShack) +38"
10. Jussi Veikkanen (Fin/FDJ) +41"